Brief Description: Jebediah Humphries, at the age of fourteen, is undoubtedly the clumsiest, most accident-prone and very worst Wizard in the world, and has certainly acquired a reputation as such at his wizarding summer camp. However, his skills are tested to the utmost when his parents are held to ransom by Ogres and he is catapulted, along with four hapless friends, into a series of hair-brained schemes – kidnapping and theft included – leaving disaster in their wake. But there’s more to his parents’ disappearance than meets the eye – a dark and evil presence is plotting revenge, and the teenagers become entangled in a web of treachery that threatens their very lives. Pursued by the Gnome Mafia and a collection of the most unsavoury characters that the magical community has to offer – and aided and abetted by a Leprechaun and a commando Fairy – the clock is ticking and time is running out to find the ransom money and save his parents’ lives. About the Author: Nichol Williams was born and raised in Yorkshire where she now lives with her children. An avid reader from early childhood, she has developed the ability to imbue the enthralling characters in her story with her own quirky style and sense of humour, enabling her readers to be transported to, and totally immersed in, a realistic yet magical world. With some trepidation I began to read this book, not being a great 'Harry Potter' fan. I had heard it had many similarities. How wrong I and the rumours were. Refreshing and enjoyable, Jebediah is a great hero and the Gnome Mafia, hilarious. I also enjoyed the fresh use and outlook of some more traditional fantasy figures. Well done. A PUDSEY art student will see his ghoulish designs adorning the cover of the new edition of a children’s book. Fulneck School sixth former, Mohsin Ahmed, won a competition to design a new cover for the latest edition of the children’s book S.N.O.T.. 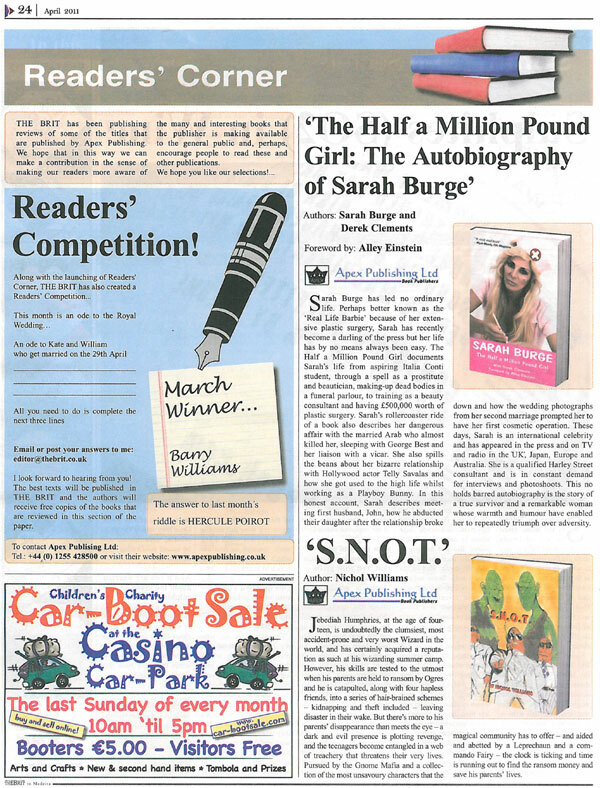 The competition, which was open to local schools, was run by the book’s author, Pudsey mum Nichol Williams. Mohsin’s design was chosen and the A level art pupil was presented with a signed copy of the book and a cheque for £100. Mohsin’s art teacher said that the design was outstanding because the 16-year-old had only started to study graphics in September 2004. And the author was so pleased with the design that she will try to commission Mohsin to do some further artwork for her next title. S.N.O.T. was Nichol’s first book, but it proved so popular that 500 copies sold out in just two months. 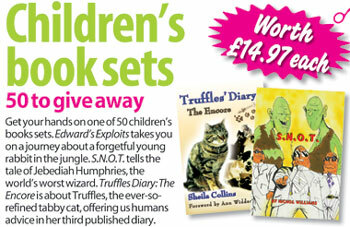 “We thought that it would be nice to have a different cover for the reprints and to have a competition for young people. We were worried that we would have to have a professional artist to touch up the design but there was no need. “This was a great design and I knew it was the one as soon as I saw it,” she added. Mohsin’s design features a trio of gangster gnomes. S.N.O.T. follows the adventures of a clumsy trainee wizard called Jebediah Humphries, whose parents are kidnapped and held to ransom by ogres. Other characters include the gnome mafia and a commando fairy. Nichol’s second book about Jebediah is due to be released within the next five months. Nichol said that she was astounded by her book’s success: “I think it has sold mainly through word of mouth and a lot of Americans have been buying it as well,” she said. S.N.O.T. is published by Apex and is available now in bookshops. You just know that a book for kids entitled S.N.O.T is going to be a huge success. I remember when I was a child seeing a candy bar called SLIME. I couldn’t resist that, either, and spent all my pocket money on it. It didn’t taste particularly good, but seeing the look of horror on my parents’ faces as I chewed my way through the dayglo - green toffee was reward enough. Unlike SLIME, S.N.O.T is every bit as good as promised. Jebediah Humphries is the hero of S.N.O.T, and is a wizard. He’s only fourteen years of age, mind you, and holds the dubious reputation of being the worst wizard in the world. Jebediah has his work cut out, then, when his parents are kidnapped by Ogres. (Williams capitalises Ogres in the sure and certain knowledge that by doing so they’ll seem even more menacing. It works). I could spoil things by telling you the ultimate fate of Mr. And Mrs. Humphries, but I’m far too nice to do that. Buy the book and see for yourself. 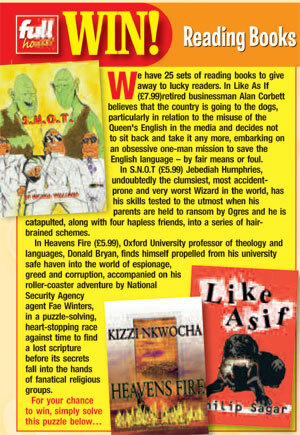 S.N.O.T is a delicious read and my advice to kids is to keep it well away from your parents. If you don’t they’ll be reading it for themselves at least once and you might find you’re an adult yourself before you get your hands on it. Harry Potter, eat your heart out! A PUDSEY mum might be Yorkshire's answer to JK Rowling. For Nichol Williams has just had her first magical children’s book published – but, she says, it is nothing like Harry Potter. S.N.O.T. is the Pudsey office worker’s first attempt at writing and 34-year-old Nichol, was shocked at her swift success. “It was a bit of a surprise as my partner sent it off to the publisher,” she said. Within a fortnight Nichol had a letter saying that the publishing company loved her idea. Less than six months later, Nichol’s book was in the shops. S.N.O.T. was originally written for Nichol’s sons. “It is very difficult to find books for boys and it can be very difficult to get them to read,” she said. And Nichol should know – she lives with her two sons and her partner’s two sons who are all between the ages of nine and 15. S.N.O.T. got a good reception from the children. “It is a very humorous book,” said Nichol. “I also think adults will enjoy it if they still have a child’s twisted sense of humour. It is very easy to follow and to read as well,” she added. The book follows the adventure of a clumsy trainee wizard called Jebediah Humphries whose parents are kidnapped and held to ransom by ogres. Other colourful characters include members of the gnome mafia and a commando fairy. The book is aimed at eight to 11 year-olds. Nichol is now busy writing a sequel. S.N.O.T. is published by Apex and can be ordered at http://www.amazon.co.uk priced at £5.99. It will also be available shortly at good bookshops. 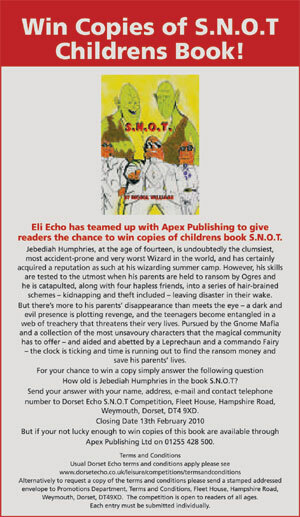 S.N.O.T, not the most wonderful of titles for a book, but this is the first in the series of Jebediah Humphries has won ‘The clumsiest wizard in the world award at the age of only 14 or so his reputation at summer camp goes anyway. Jebediah’s powers are put to the test when his parents are held to ransom by Ogres, so now he is thrusted along with four friends into a series of nightmare schemes that leave devastation wherever they go. Read this book and help Jebediah save his parents before the Gnome Mafia get him. Despite the not very nice name of the book, the story is actually extremely good, slightly ‘boy humour’ in places which all boys will probably love. S.N.O.T (paperback) wins 7 pizza slices. Puffin's Plaice (ITV Channel Television) featured and run a competition on 'S.N.O.T.'. Abounding with mythical creatures and magic, this book is a must for those who love fantasy. However, it shies away from the norm and gives a twist to what we think wizards, gnomes and fairies are like. You laugh out loud at situations and the way a fourteen year olds mind works. The author has captured what children and adults find funny. I must admit I liked this book as much as my kids and I hope we don't have to wait long for another instalment. The way Nichol Williams has created her characters and magical creatures is brilliant and original. There's no confusion unlike some books, with twists and turns that don't lead anywhere or characters that suddenly pop up without explanation. All the characters and plots fall easily into place. The author has captured how strong friendships can be and how much they mean to kids. That mushy girly stuff aside, I can't think of a funnier book I've read in ages. Simple, yes, but sometimes they're the best. Thank god for a book that doesn't preach, and have an inner meaning, but just plain fun. I loved every minute of it especially the gnome mafia which was nothing short of genius. Everything in the book was completely fresh as no one has ever done anything like this. I'm looking forward to the next one. Hilarious and serious, loads of fun to read. I really enjoyed it. I really enjoyed S.N.O.T., it made me laugh all the way through. The gnomes were ace but Jebediah is quite cute and a real hero. I can't wait to find out what happens next. It’s funny, entertaining and more importantly the characters are not one dimensional. It is in the genre of the Harry Potter books and although I enjoyed them, this is a more faster, more grown-up style of writing. I would definitely recommend this. The characters were hilarious and the situations Jebediah got himself and his friends into were funny. The characters seemed realistic although magical. The gnomes were my favourite and certainly not what i expected gnomes to be like. It's one of the best books i've read for ages and i really hope there's a second one soon. It's BRILLIANT! S.N.O.T. made me laugh from start to finish. The gnomes are hilarious and as for the fairy, well she's awesome. I could relate to the things that go wrong for the main Character and I felt really sorry for him at times. I makes a change for the magical creatures to be different from what you'd expect. I read this in a day because I couldn't put it down and i'm going to be reading it again soon. I hope there's another adventure for Jeb and his friends. The storyline to S.N.O.T. was really good and the characters were an unusual twist to what magical people are normally like, especially the gnomes. It made me laugh all the way through especially the bit with the dragon. I really enjoyed it. Excellent. Finally a book that has kids humour and isn't childish with boring characters. A fascinating read, highly entertaining for both young and old. Looking forward to reading more from this new author. I brought this book for my kids to read and after listening to them raving about it decided to read it myself. I can say that it is a superbly written and imaginative story with a host of colourful characters that come to life in the readers mind. Easy to read for children and adults alike, I wholeheartledly recommend this most enjoyable book. A fresh and entertaining story line, full of imaginative characters and humorous tales. A delightful read for the young and young at heart readers alike. Highly recommended. A truely remarkable book! One I will read again and again, a true classic! I thought it was a great book and I really enjoyed it, so much, that I could not put it down until I had read it all. I bought this book to read at school and I've passed it round all my friends. It's easy to read and packed with fun characters. I love the idea of the gnome mafia and the stupid things Jebediah does. It's the sort of book you can read over and over again and still laugh out loud. The ending has been left open so hopefully there will be another. If so I'm going to get a copy. I finished this book the same day I started reading it. As a big fan of Artemis Fowl I certainly wasn't disappointed by it. The plot although simple is interwoven with humour that in my opinion most books simply lack. The concepts of the magical characters are superb from the mafia gnomes to the gutsiest hitman you could imagine. Hopefully there's going to be more adventures for Jebediah and his friends to come. Forget Shadowmancer this would make a far better film. Abounding with mythical creatures and magic, this book is a must for those who love fantasy. However it shy's away from the norm and gives a twist to what we think wizards, gnomes and fairies are like. You laugh out loud at situations and the way fourteen year old's mind work. The author has captured what children and most adults find funny. I must admit I liked this book as much as my kids and I hope we don't have to wait long for another installment. The lead character Jebediah Humphries has you in stitches from start to finish and proves heroes come in all shapes and sizes. The magical creatures aren't weak and watery like most books and they make you think twice about how you would ordinarily imagine them. The idea of the gnome mafia is brilliant, as is the leprechaun (my favourite) and fairy ect. The plot is simple but written with humour that even adults will find hilarious. The author has cleverly left the ending open so it looks like there will be another - I definitely hope so.